Some time ago I saw a documentary about “Clair de Lune” Debussy’s well known music and found out that the music meant to sound as the waves of the sea: 7 waves, first little ones, followed by big ones! The poet was born on the 19th January 1809. According to The Guardian, last Wednesday was the first time in 60 years that his faithful admirer didn't show up to put three roses and a half bottle of Cognac on his grave. Maybe he's dead himself, who knows? 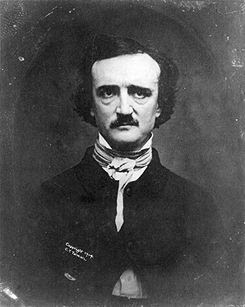 Poe's poetry, however, stays with us. Forever. According to The Economist, women make up already 50% of the workforce in the USA. In Scandinavia, this % is even higher. "The change is dramatic(...). A generation ago working women performed menial jobs and were routinely subjected to casual sexism—as “Mad Men”, a television drama about advertising executives in the early 1960s, demonstrates brilliantly". This mass movement began during WW II when women had to get to grips with the jobs men did before. 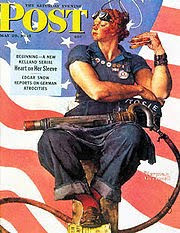 Rosie the Riveter (pictured above by Norman Rockwell in the Saturday Evening Post) was an icon for this new woman. But things are not yet as they should be: women still earn tipically less than men and a very small % of them are running big companies. In sum, lots to do yet. The words used for those small and convenient machines reflect the priorities of a society. The American call them cellulars (emphasis on the technological aspect), the English mobiles, as in Portugal, Spain, etc (usually societies that once had an empire and were used to move around). 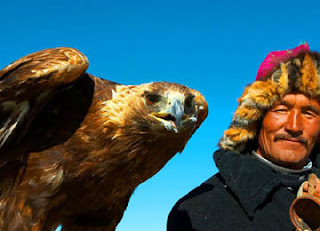 The Germans, pratical as always call them Handy and the Chinese sho ji (hand machine). Some talk, some text. 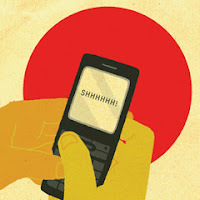 The Japanese consider it rude to have a conversation that everybody can hear text a lot (as Indonesians, maybe for different reasons). The Spanish talk a lot and don't activate voice mail that much. Americans and Puerto Ricans talk more than they text. Whwre ant the way people use their mobiles also tells a lot about thwe way they see the town a a collective space. parisians tend to talk or text on pavements even in the street, Londoners prefer to gather at the entrances of tube stations. In Portugal, as everybody who live here well knows, we like to share our private lives with lots of people so we tend to shout during conversations in buses, restaurants, cafés, everywhere (Brasilians are great at that too). Coverage is also important too. For instance the Finns choose operators that work in tunnels (for good reasons, specially in Winter).